This past week I realized we had already gone through a half a bag of oranges in about 3 days! Don’t ask me why, but it got me thinking about making a new soap recipe. 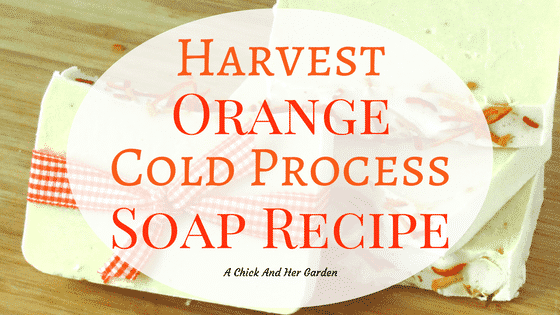 A harvest orange soap recipe! Maybe it was the smell of orange peels constantly lingering on my hands after peeling an unknown amount for the little ones. Then combine it with the color of the leaves outside the window and the harvest candle burning in the kitchen. I knew I couldn’t have it just the strong sweet smell of oranges. It’s fall here and I’m thinking refreshing yet warm and woodsy! Aside from the scent, I needed this soap to be extremely moisturizing. Now that it’s the time of year for dry air and the wood stove being fired up, we can get some seriously dry skin around here. Especially after all the chores and hand washing! After reading Jan Berry’s book Natural Soap Making, I love finding ways to include natural ingredients in my soaps for their added benefits. And in this case I used orange peels. So what are the benefits of adding orange peel to soaps? Oranges contain citric acid which is helpful in fighting acne! The citric acid helps to dry up the oils that are causing build up in your pores. Orange peels are also a natural bleaching agent that can help in lightening dark spots from acne or sun spots. Not to mention the wealth of anti-aging properties, including Vitamin C which helps keep your skin firm and restore collagen, as well as antioxidants that help fight wrinkles! 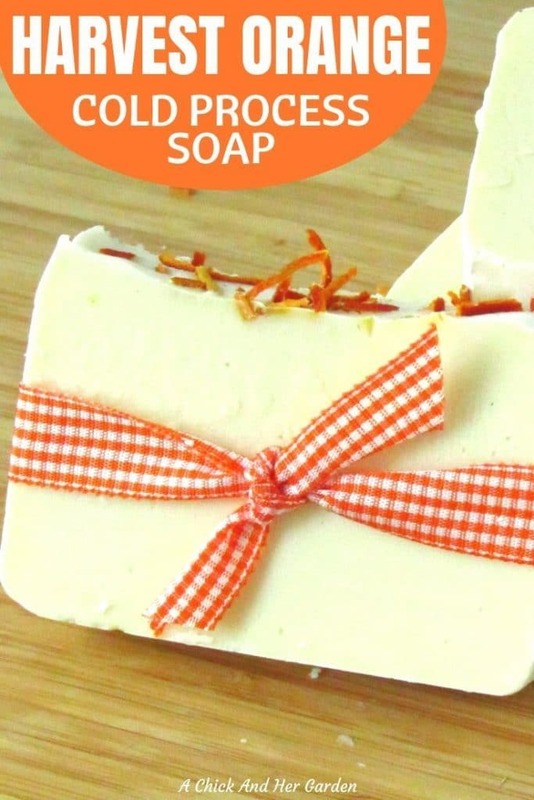 How did I add orange peel to my Harvest Orange Soap Recipe? In my recipe for Cucumber Mint Soap I added cucumber and mint through the liquid. But with this recipe I added orange by infusing the peels into the oil! The peels are more concentrated than the actual orange itself. So it was a better fit to infuse them into oils, rather than use the juice for the liquid portion of my soap. Dehydrated Orange Peel slivers, for decorating the top. Slice orange peels into thin strips and dehydrate them. You can do this by using a dehydrator, your oven set at 170°F, or just leaving them out for a day or two. Infuse olive oil with orange peels. You can learn how to do that here! I used about a cup of infused olive oil in this recipe and added more plain olive oil to reach a total amount of 453.6 g of olive oil. Measure out distilled water in a heat safe liquid measuring cup. Measure your lye in a container that is specifically used only for lye. Sprinkle the lye into the distilled water and mix gently with a silicone spatula, again designated to only use for soap making. Set this solution aside and rinse out your lye measuring cup. In an aluminum or stainless steel pan measure your shea butter. Heat this on the stove until liquid. Measure your remaining oils and add them to the shea butter. Allow your lye solution and oils to cool until they reach a temperature between 90°F and 115°F as well as only 15 degrees in difference between the two. When they have reached the right temperatures drizzle the lye solution into the oils. Use a stick blender to alternate stirring and blending in 30 second intervals until you reach trace. At trace, add your essential oils and blend in. Pour your mixture into a log mold, like this one. Sprinkle the dehydrated orange peel slivers on top. Cover with plastic wrap and cover with a blanket or towel. 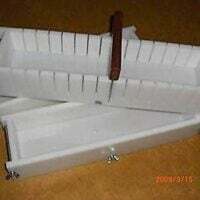 Allow your soap to sit for 24-48 hours before removing it from the mold. After 24-48 hours, remove the soap log from the mold and slice it. Allow it to cure for about 4-6 weeks and your all set. I warn you that the smell will be amazing and you won’t want to wait but it will be worth it! If you’re looking to learn about natural soap making I cannot say enough how much I have learned from Jan Berry! Her Natural Soap Making eBook Collection is my soap making bible, and you can get your copies here! Have you made soap before?? Tell me your favorite recipe in the comments! Nice. Thank you for sharing healthy soup recipe..